Ethnobotanical Leaflets 14: 518-28. 2010. ����� The effects of petroleum products: Petroleum Motor Spirit (petrol, PMS), Automobile Gas Oil (diesel. AGO), Dual Purpose Kero (kerosene, DPK), were investigated on the chlorophyll accumulation in Barbula lambarenensis. This plant with its substrates were collected from its natural populations, taken to the screen house and divided into ten regimes widely separated. Each of these regimes was irrigated with borehole water for two weeks, thrice a week to bring about hydration. The three petroleum products were separately diluted with borehole water in 1:1 ratio to give 50% concentrations. Moreover, 100% of these products were also used .The 50% concentrations were separately used to irrigate the first three regimes, A, B and C for 20 weeks .The D, E and F regimes were irrigated with 100% kerosene, petrol and diesel respectively for the 2 weeks and later with borehole water for twenty weeks while the G regime was irrigated with borehole water (Control). Irrigations were done thrice a week. Samples of B. lambarenensis were collected fortnightly for chlorophyll extraction and the chlorophyll a, b and total chlorophyll content determined with the aid of spectrophotometer .It was observed that the 50%� treated moss plants had greater chlorophyll a, b and total chlorophyll than the control but their concentrations were statistically the same. The 100% treatment gave greater chlorophyll a content than the control, PMS treatment had greater chlorophyll b than the control but the reverse were for DPK and AGO treated moss plant. However, all these values were the same statistically. The same results were found for the total chlorophyll except that the DPK, AGO and Control treatments had the same value statistically while DPK, Control and PMS treatments were the same statistically. The 50% treatments had worse effects than the 100% followed by borehole water treatments. Furthermore, the two concentrations had the same effects on the chlorophyll contents but DPK and AGO had significantly greater chlorophyll b concentrations in 50% treated regimes than 100% treatments at 5% level of significance. Petroleum products damaged the chlorophyll apparatus of the plant making the treated to produce greater chlorophyll contents than the Control. Oil industries play a major role in the economies of oil producing countries such that petroleum products have constituted the major source of fuel for driving engines and automobiles as well as for domestic needs. Oil industries have also facilitated the development of infrastructures such as road, telecommunication, industries and other facilities that have brought about better standard of living. Apart from these benefits, this sector has also affected the environment negatively such that lives and valuable properties have been destroyed. The effects are worsened by oil spillage into water bodies and land resulting to the death of man, animals and plants and the pollution of the environment. Their uses have increased the incidence of oil spillage in the process of transportation as well as their discharge in depots and petroleum stations or areas where needed. Petroleum products have been reported to have adverse effects on plants irrespective of their habits or habitats. Such effects are manifested in reduced and retarded growth, vestigial plant parts, morphological defects, and irregular physiological processes such as chlorosis and in extreme cases, death. Mckendrick (2002) reported that wilting, defoliation and loss of productive cycle as immediate impacts on the�� vegetation. Furthermore, destruction of normal plant water relation which indirectly affects plant metabolism with respect to nutrient availability or directly toxic to plant (McCown et al., 1972). The most urgent problem of man is environmental pollution as clean air is no more a normal feature of the environment. The environment is now loaded with pollutants from agricultural chemicals, radioactive materials, sewage and chemicals in water and solid wastes on land (Little and Martin,1974). Natural and agricultural sources, energy production and recycling operation, urban and industrial complexes and cars are sources of atmospheric pollution (Seaward and Richardson,1990, Wegner et al.,1990).The presence of heavy metals such as lead and cadmium in the petroleum products have been indicted in the blockage of conducting vessels of plants thereby interfering in the physiological and biochemical processes necessary for plant development (Jastrow and Koeppe 1980). Petroleum, when subjected to fractional distillation and refined gives the Dual Purpose Kero (kerosene), Automobile Gas Oil (diesel) and Premium Motor Spirit (petrol). Each of these products has important usage in the environment. Kerosene is widely used in aviation industry as fuel for jet engines as well as in the homes for cooking in stoves and lightening in lanterns. Diesel is used for power generating plants and by heavy trucks and also as illuminant. In the same vein, petrol is used to move automobiles and for light generation by generators. The exploration, transportation and utilization of these petroleum products pose serious danger to the lives of the flora and fauna in the environment. There is the need therefore to ascertain or monitor the pending risk or potential damage level of these pollutants from time to time. A good bio-indicator is therefore required. Renzaglia and Vaugh (2000) identified bryophytes as the primary receptors of atmospheric deposition. To this effect, Barbula lambarenensis, a common moss has this potential and can be used to monitor the effects of petroleum products. This research was designed to investigate the effects of petroleum products on the chlorophyll accumulation in B.lambarenensis by simulating oil spillage. Barbula lambarenensis with its� sandcrete blocks (substrates) were collected from their natural habitats and brought to the Screen House in the Biological Garden, University of Ilorin, Ilorin, Kwara� State, Nigeria. These sandcrete blocks with the colonizing plants were divided into seven regimes labeled A, B, C, D, E, F and G.� These seven regimes were irrigated with borehole water for 2 weeks, thrice a week to bring about the hydration of these plants. Three petroleum products: Dual Purpose Kero (DPK) or simply kerosene, Premium Motor Spirit (PMS) known as petrol and Automobile Gas Oil (AGO) or simply diesel was used as irrigants of these different regimes.� Two sets of irrigants were prepared thus: the three products mixed separately with borehole water in 1:1 ratio (50%) and the second set were 100% DPK, 100% PMS and 100% AGO.� The first set of irrigants were used to irrigate regimes A B and C at other days for 20 weeks while the second set were used for 2 weeks at other days followed by borehole water irrigation for 18 weeks for regimes D, E and F while regime G was irrigated with borehole water (Control). From each of the regimes, moss samples were collected fortnightly and chlorophyll extraction carried out with 80% acetone and the chlorophyll contents determined with the use of Spectrophotometer model Camspec 105.� The formulae of Strain and Svec (1966) were used to calculate the chlorophyll a, b and total chlorophyll contents of each sample. 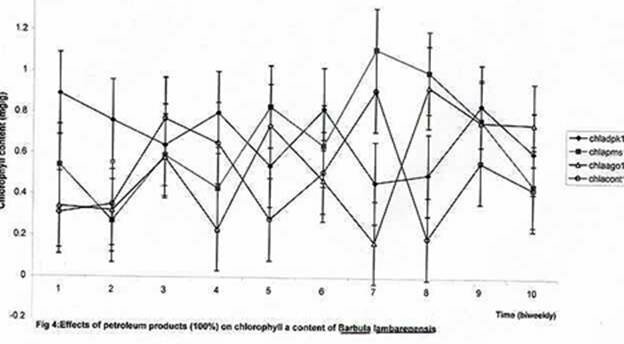 Data generated from these analyses were subjected to Analysis of Variance to show the differences in the effects of these petroleum products on chlorophyll contents of B. lambarenensis. The mean values were further separated with the use of Duncan Multiple Range Test and Students t- test was used to compare the effects of the two concentrations of petroleum products on� the chlorophyll contents of this plant. 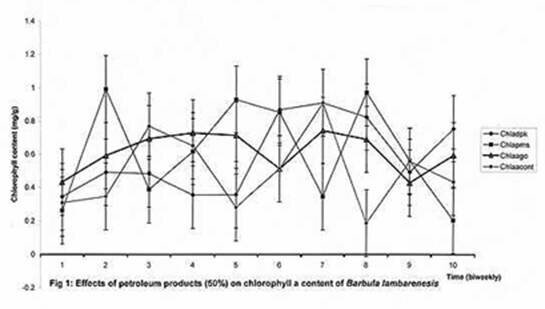 The effects of the three petroleum products: DPK, PMS and AGO on the chlorophyll accumulation in Barbula lambarenensis are shown� in Figures 1, 2 and 3 for 50% concentration and Figures 4, 5 and 6 for 100% concentration. 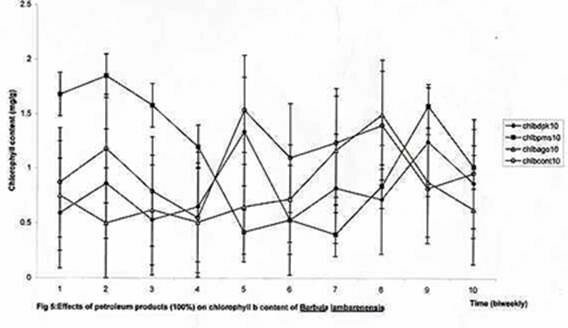 Figure 1 shows the effects of these� irrigants on chlorophyll� a content of B. lambarenensis.� A close observation of these values for 20 weeks showed no distinct pattern but fluctuation, when the effects of these irrigants on chlorophyll a were statistically tested.� It was found that all had similar effect (F=0.593) though there were numerical differences. The mean values of chlorophyll a for Control was the least (0.4968mg/g), followed by the DPK (0.5898mg/g), then PMS (0.6134mg/g) and finally AGO (0.6173mg/g) in an increasing order.� Figure 2 shows the effects of 50% of the 3 irrigants in chlorophyll b contents of B. lambarenensis.� The mean values of chlorophylls b contents are as follow: Control (1.0464mg/g), PMS (1.2555mg/g), AGO (1.3345mg/g) and DPK (1.3691mg/g).� These values were found to be statistically the same at 5% level of probability (F=1.768). The effects of 50% petroleum products on total chlorophyll of the plant are shown in Figure 3.� The least content was found in the Control (1.3677mg/g), followed by AGO (1.6016mg/g), DPK (1.6523mg/g) and finally AGO (1.6953mg/g).� These values were found to be statistically the same (F=1.556). A general observation of these results showed different effects on the different chlorophyll contents but the Control had the least showing that these irritants had effects though not significant on the chlorophyll contents of this plant.� Generally, chlorophyll a is usually greater than chlorophyll b but the reverse was found in this study. 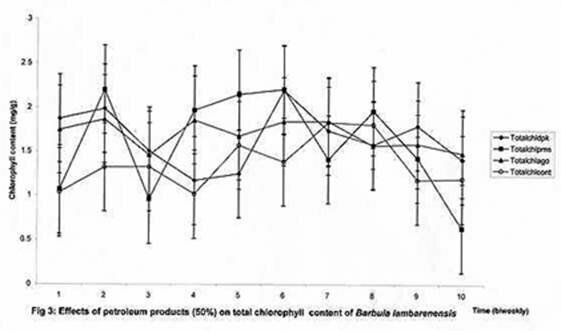 Figure 4 shows the effect of 100% of petroleum products on chlorophyll a content of B. lambarenensis. The effects were found to be statistically the same (F=1.694) but different numerically. Chlorophyll a content found in this study were 0.4964mg/g, 0.5285mg/g,0.6630gmg/g and 0.6869mglg for Control, AGO, PMS and DPK respectively. The effects of these irrigants on chlorophyll b are shown in Figure 5.� All the effects are the same statistically (F=1.803) and the mean values are 0.7914mg/g, 0.8153mg/g,1.0459mg/g and 1.1096mg/g for AGO, DPK, Control and PMS respectively. �Figure 6 shows the effects of petroleum products on total chlorophyll contents of B. lambarenensis. The mean total chlorophyll contents followed same trend like chlorophyll b. when these values were tested statistically, they were found to be the same statistically (F=2.302) at 5% level of significance. A separation of the means: 1.1309mg/g (AGO), 1.2783mg/g (DPK), 1.3685mg/g (control) and 1.5163mg/g (PMS), with Duncan Multiple Range Test (DMRT) showed that the effects of AGO, DPK and Control are statistically the same while DPK, Control and PMS are statistically the same but AGO and PMS different statistically. Photosynthesis is the major determinant of growth and productivity. The basic raw materials for photosynthetic process are the chlorophylls a and b which absorb the solar energy which is later converted to chemical energy contained there in the synthesized organic food substances.� Chlorophyll a is primarily associated with the light reaction and the acceptor of the absorbed light energy by chlorophyll b which is used to drive the photochemical events of photosynthesis (Prezein and Nelson, 1997).� The amount of chlorophyll in any plant is positively correlated to the primary productivity of the plants. Raeymakers and Longwith (1987) reported that the determination of chlorophyll contents in plant is a useful estimation of the primary productivity and has been used as bioassays of environmental stresses in eco-physiological researchers. Any factor that destroys or brings about chlorosis in plant affects the physiology, photosynthesis, growth, productivity and respiration of the plants.� The treatment of this plant with petroleum products affected or damaged their photosynthetic apparatus Warner and Caldwell (1980) reported that plants exposed to strong or high light intensity can have their photosynthetic apparatus damaged. Heavy metals such as� Pb� Ni, Hg, Zn and other pollutants such as SO2 are responsible for the disappearance and the changes in the flora around the urban and industrial area (Richardson,1981). The metallic components or additives in these petroleum products are likely to be associated with the damage of the chlorophylls.� Generally, chlorophyll a is more than chlorophyll b in mosses (Ogunbiyi, 2003) and same is true of higher plants.� The higher concentrations of chlorophylls a, b and total chlorophyll observed in the treated than the Control suggest that the chloroplast could have been damaged or affected thus liberating these pigments.� Summarily, the pigments could have been damaged by the petroleum products used. Fergusson et al (1978) attributed the absence of bryophytes in cities and industrialized areas to pollugenic agents. The hazardous effects of these petroleum products on the chlorophyll contents may be hinged on the presence of Pb in these products, which is a borderline metal (Nieboer and Richardson, 1981) and the most toxic in this class (Richardson,1981). 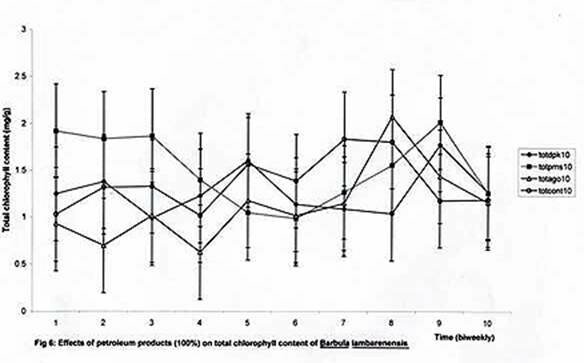 Richardson (1981) further reported that 0.77ppm and 66ppm Pb in culture delayed the germination of spores of Funaria hygrometrica for 2 days and 12 days respectively. Krupinska (1976) opined that Pb affects mitotic division in moss cells. Watering of Hylocomium splendens and Rhytidiadephus squarrosus once a day with 1000ppm lead acetate solution discoloured them within a few days. These observations therefore confirmed the indictment of Pb in this study. Jastrow, J. D. and Koeppe, D. E. (1980). Uptake and effects of cadmium in higher plants. Cadmium in the environment. Part 1:Ecological Cycling. Wiley InterScience Publication, John Wiley and Son, New York. Krupinska, I. (1976). Influence of lead tetraethyl on the growth of Funaria hygrometrica L. and Marchantia polymorpha L.. Acta.Soc. Bot. Poloniae 45:421-428. Little, P. and Martin, M. H. (1974). Biological monitoring of heavy metal pollution. Environmental Pollution 6:1-19. Nieboer, E and Richardson, D. H. S. (1981). Lichens as monitors of atmospheric deposition. In Neisenrich, S. J. (Ed.). Atmospheric Inputs of Pollutants to Natural Water. Arbor Science Publishing, Michigan, USA. Ogunbiyi, B. O. (2003). Spore germination and growth performances of Barbula lambarenensis, Bryum coronatum and Hyophila� involuta.� Unpublished� M. Sc.� Thesis, University of Ilorin, Ilorin, Nigeria. Prezein,� B. B.� and Nelson, N. B. (1997). �The formation of ATP and reducing power in the light.� In D. T. Dennis, D.H. Turpin, D .D . Lefebure and D.B. Layzel (Ed.) Plant metabolism, 2nd Edition Longman,� London. Raeymakers , G. and Longwith, J. E. (1987). The use of Dimethyl Suffoxide (DMSO) as a solvent to extract chlorophyll from mosses. Symposia Biological Hungrica �35: 151-163. Renzaglia, K.S. and Vaugh, K. (2002). Morphology and classification of the Anthocerotophyta J. and D. B. Goffinet . Cambridge University Press, Cambridge, U.K. Pp. 1 � 20. Richardson, D. H. S. (1981).� The Biology of Mosses. Blackwell Scientific Publication, London, Edinburgh, Pg 103-105. Strain, H.H. and Svec,W. A. (1966). Extraction, separation and isolation of chlorophylls. Pp. 24- 61, In L.P Varnon and G.R. Seely (Ed.). Chlorophylls .Academic Press, New York. Warner, C. V. and Caldwell, M. M. (1980). Influence of photon shop density in the 400-700 waveband on inhibition of photosynthesis by UV-B (280-320nm) radiation in soybean leave: Separation of direct and immediate effects. Photochemistry and Photobiology 30(3):341-346. Wegner, J. W., Schaik, M. J. M., Van-Aiking, H. I. and Van-Schaik, M. J. M. (1992). Active biomonitoring of polycyclic aromatic hydrocarbon by means of mosses. Environmental Pollution 76(1): 15-18.